The Elder Scrolls series has been known for its effective use of choice and customization, as well as its sense of adventure which is supported by large maps full of mysterious areas to explore. The Elder Scrolls V: Skyrim is on the horizon, and will continue this heritage with another extremely large fantasy-borne world. Bethesda has stated that the map will be roughly the size of Oblivion‘s, although it will contain a wider variety of areas and many more surprises. There will be a total of five major cities along with nearly 150 dungeons scattered around the map. As usual, there will be plenty of enemies to battle, ranging from the small fox, to ginormous creatures like bears and mammoths. 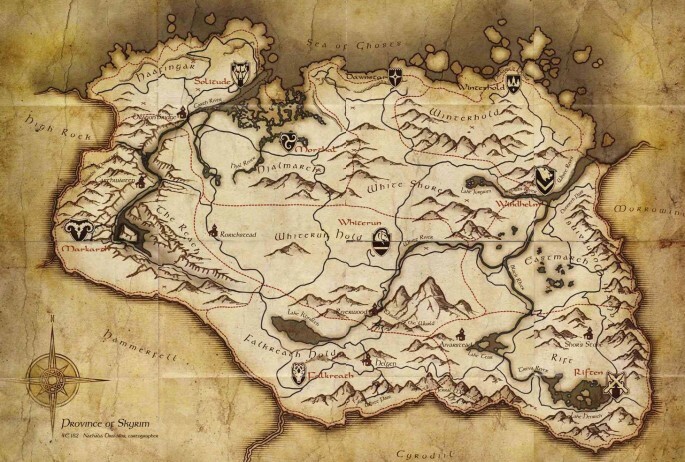 If you find this map intimidating, you may want to pre-order your copy of Skyrim at Amazon.com. As a pre-order incentive, Amazon is offering a free “premium” physical Skyrim map to help you on your journey. There’s also a $10 pre-order credit on Skyrim, so it’s a win-win. Skyrim will release on store shelves this November 11th. Let us know what you think of its map below.